A little over a year ago, the northwestern Armenian city of Gyumri, home to Russia’s 102nd army base, welcomed Russian President Vladimir Putin to town with pomp, circumstance, and waving flags. Now, protesters in the town are trampling Russian flags underfoot instead. Armenia’s inability to secure the custody of a Russian conscript charged with the January-12 murder of six members of a local family – the youngest just two years old – contributed to this change of mood. Although Armenian General Prosecutor Gevorg Kostanian has stated that the defendant, Private Valery Permyakov, will face trial in Armenia, which authority will conduct the trial remains unclear: a Russian military tribunal at the 102nd base, where Permyakov is being held, or an Armenian court. The lack of a clear answer to this question is jeopardizing the strong historical ties between Armenia, Moscow’s strongest ally in the South Caucasus, and Russia, local analysts say. Late on January 15, hours after the Avetisian family’s funeral, clashes with police broke out outside the Russian consulate in Gyumri as hundreds of protesters tried to enter the building to demand that Permyakov be handed over to Armenian law-enforcement and tried in an Armenian court. At least 13 people reportedly were hospitalized as a result of the scuffle, and around a dozen, including journalists and human-rights activists, were arrested. Russia claims that it has the right to try Permyakov since he had deserted from the Gyumri base. Armenian government representatives have been allowed into the 102nd army base to confirm his presence in a solitary confinement-cell, RFE/RL reported. They have said that they would pass on protesters’ concerns to Russian officials. But many Armenians aren’t buying it. Families are arguably the most sacred of social institutions in this tiny country of just under three million people. That status exists elsewhere in the region, too, but in Armenia, the tough-knocks survivor of war and vast migration, it exercises a particular pull. Threats to families may come from neighboring Azerbaijan or Turkey, the country’s traditional enemies, but are not expected to come from Russia, Armenia’s longtime bodyguard. For 65-year-old engineer Hrant Hambardzumian, the fact that the Armenian government does not collect a fee from Russia for its Gyumri-base and paid it 20.5-million drams (about $50,000) in November for incurred expenses makes the murder of the Avetisian family an insult as well as a tragedy. “Is this the security promised by the government, when your family is slaughtered while sleeping at home?” scoffed Hambardzumian, a resident of the capital, Yerevan. That sense of insecurity ultimately could lead to a change in Armenians’ receptiveness toward a tight strategic partnership with Russia, predicted Richard Giragosian, director of Yerevan’s Regional Studies Center. “[I]t seems clear that this incident and the way the Russian military handles it, may become a turning point for the traditionally loyal and subservient Russian ally, Armenia,” he said. The incident in Gyumri is not the first, however. In 1999, two drunken Russian servicemen based at Gyumri, Denis Popov and Alexander Kamenev, opened fire on random passers-by, killing at least two people and injuring another ten. Then, the two men were tried in Armenia, where Popov was sentenced to 14 years in prison and Kamenev to 15. Russian officials were not immediately available to comment on her allegations. Russia’s ambassador to Armenia, Ivan Volynkin, has pledged an “objective” investigation into the Avetisians’ murders, but called on locals not to “politicize” their deaths, the state-run Russian news agency ITAR-TASS reported. The spokesperson for the ruling Republican Party of Armenia, Eduard Sharmazanov, ducking accusations that Yerevan fears Moscow, has implied the same. But with officials otherwise mute (“as mute as fish,” opined Hambardzumian), some see the government’s statements as intended primarily to serve their own interests rather than to secure a trial for Permyakov in an Armenian court. Anger over the Gyumri murders is building on wariness about Armenia’s economic ties with Russia; namely, the loss of remittances from migrants there after the sharp drop in the ruble’s value in 2014, and the subsequent spike in retail prices in Armenia. 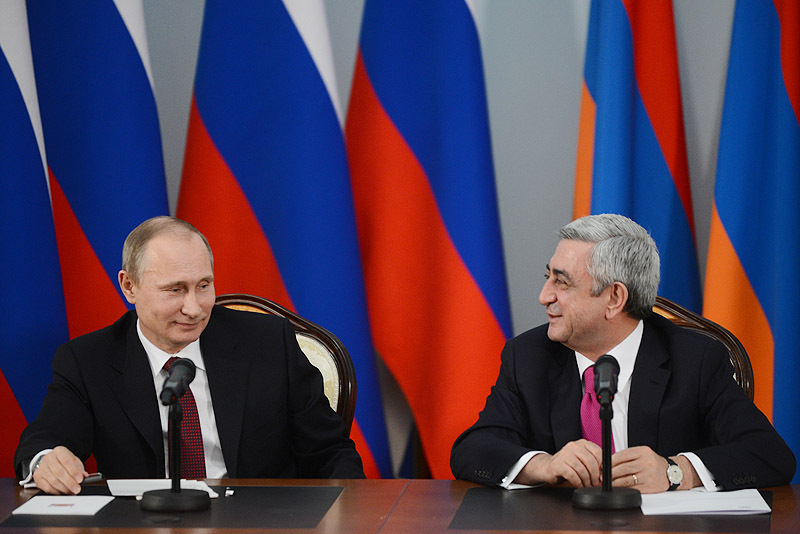 The downturn occurred just as Armenia was preparing to enter Moscow’s Eurasian Economic Union on January 2. But Russian Ambassador Volynkin emphasized that Armenian-Russian ties will survive this downturn. Some Armenian analysts agree. “The emotional must be separated from the military-political” in evaluating Yerevan’s relationship with Russia, advised Sergei Minasian, head of the political studies program at Yerevan’s Caucasus Institute. While Russia does not pay Yerevan for use of the Gyumri base, it does sell Armenia gas, weapons and military material at below-market prices, Minasian noted.